Looking for an easy way to add nutrient-density to your meals? Try this Simple Seed Mix. You’ll want to put this Simple Seed Mix on everything — from avocado toast, eggs, sprinkled on vegetables and in grain bowls — the options are endless. This simple seed mix contains, you guessed it, seeds! Seeds are typically dense in minerals, plant-based protein, fiber, and monounsaturated fats. 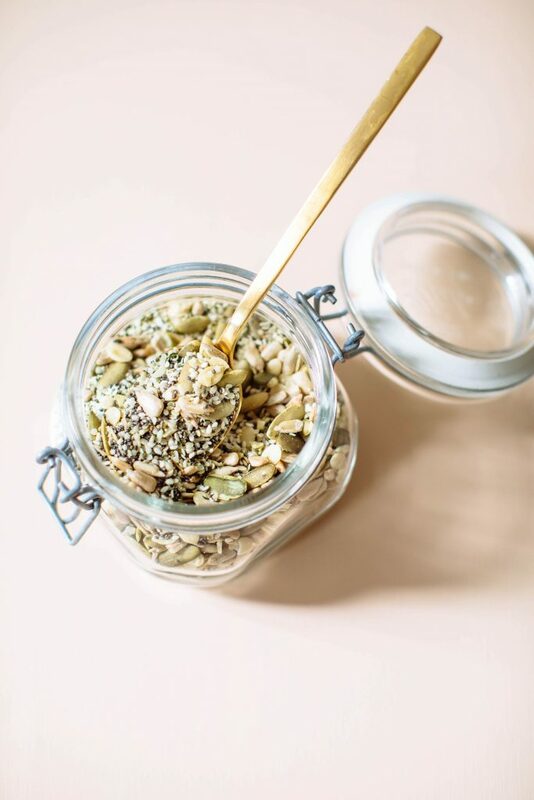 You’ll find sesame seeds, hemp seeds, chia seeds, pumpkin seeds, flax seeds, and sunflower seeds in this mix. If you’re allergic or prefer not to use one of these seeds found in the recipe, simply double up on the portion of one of the seeds you do enjoy or omit and replace with a nut. This recipe is flexible so make it work for you. This is one of many healthy eating hacks I’ve trained my clients to incorporate into their diets. It’s about finding those small tweaks you can make every day to sneak in more nutrients and to help change your habits and mindset about eating to nourish yourself. Sprinkle on top of avocado toast, peanut butter toast, etc. Sesame seeds, as with most seeds, are loaded with minerals which are incredibly important for our bodies. Sesame seeds, in particular, are great sources of magnesium, calcium, iron, zinc, molybdenum, and selenium. Sunflower seeds are incredibly mineral rich and contain vitamin E and other antioxidants which are great for helping the body fight free radicals that would otherwise damage our cell membranes, brain cells, and fat-containing molecules. Vitamin E also works to decrease inflammation which is the root cause of many diseases. The phytosterols in sunflower seeds also have been studied with lowering cholesterol and decreasing cancer risk. Sunflower seeds contain minerals, especially magnesium, shown to help reduce muscle aches, reducing blood pressure, preventing migraines, and reducing heart disease. Another key mineral in sunflower seeds is selenium, which helps the body support liver detoxification and cancer protection. Flaxseeds have gained in popularity for their healthy fat content, fiber, and also benefits for the cardiovascular system, lowering cholesterol, as well as providing anti-inflammatory benefits and digestive health. Flaxseeds may also be beneficial for those women challenged from menopause, by certain compounds promoting estrogen production and reducing hot flashes when taken on a regular basis.